NOTE: This was published on March 8, 2012, in Numismatic News under the title “Anthem Program Gets Going.” Images not published are included below. 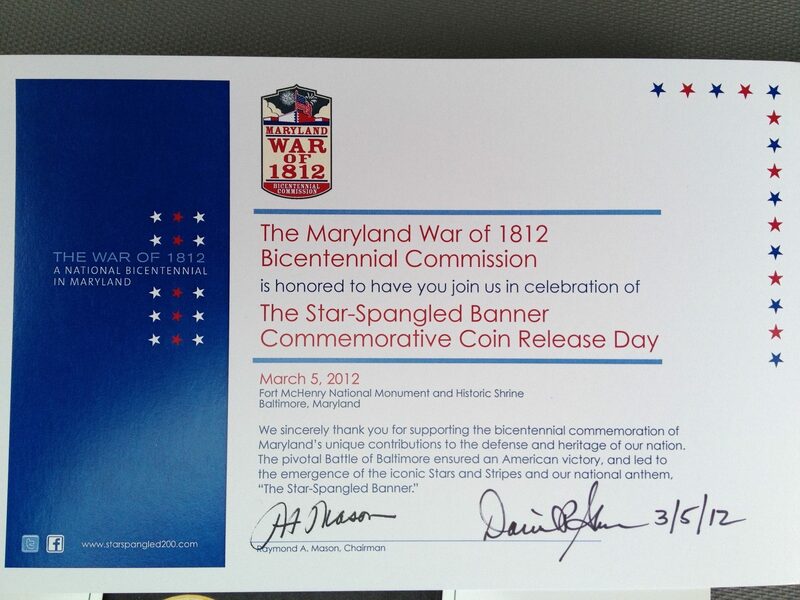 (Baltimore) — Eighty-one years (and two days) after President Herbert Hoover signed the law that made “The Star-Spangled Banner” the United State’s official national anthem, the U.S. Mint and Maryland dignitaries came to Fort McHenry to launch the 2012 Star-Spangled Banner Commemorative Coin Program. 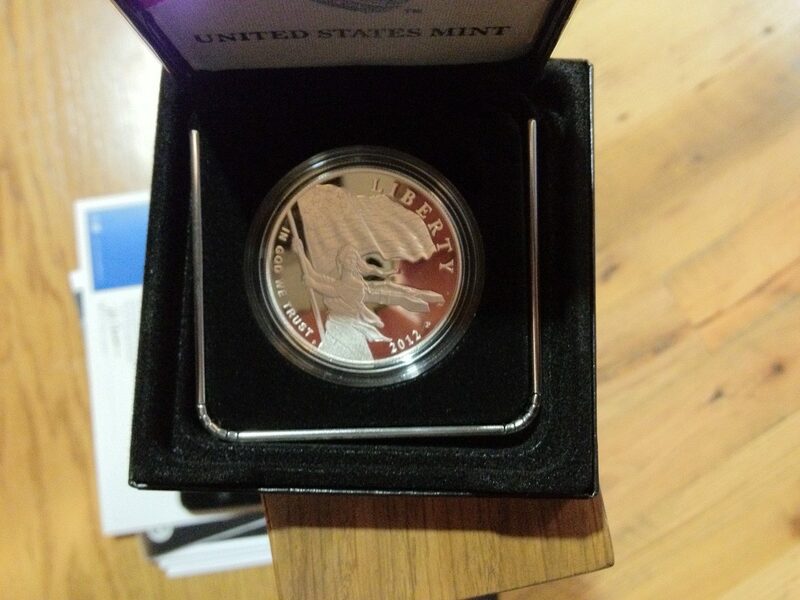 The commemorative coins are designed to honor the role of the fort in the Battle of Baltimore and Francis Scott Key’s composing the poem after seeing the 15-star and 15-stripe flag still flying after an evening of bombardment by the British Royal Navy. During the march to Baltimore after the British attack on Washington, D.C., the British took Dr. William Beanes as a prisoner for his role in capturing British stragglers and deserters. Beanes was imprisoned in Baltimore as the Royal Navy gathered forces for their attack on Fort McHenry in Baltimore Harbor. That night, Key, Skinner, and Beanes watched as the Royal Navy bombarded the fort and surrounding areas of Baltimore. As the smoke cleared on the morning of September 14, 1814, after 25-hours of bombardment, Key was able to see the U.S. flag still flying over Fort McHenry. 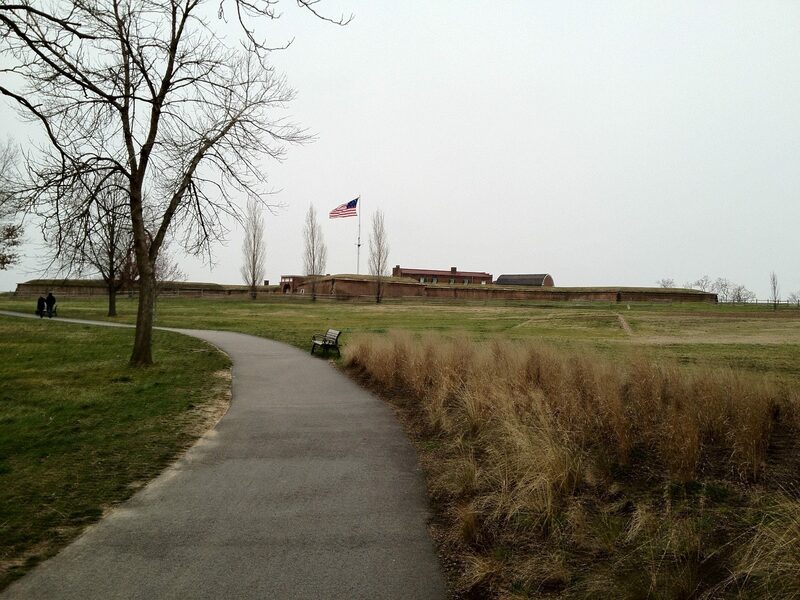 Key was so moved by the sight that after returning home, he wrote the poem “The Defence of Fort McHenry.” The poem was published in the Baltimore Patriot on September 20, 1814. When the poem was published, it was noted that it could be sung to the music of The Anacreontic Song, the official song of the Anacreontic Society. Shortly after publication, the music and words were published together by Thomas Carr and renamed the Star-Spangled Banner. Tina Orcutt, Superintendent of the Fort McHenry National Memorial & Historic Shrine, led the attendees in the Pledge of Allegiance to open the launch ceremony. After her welcome message, Baltimore’s WBAL reporter Sarah Caldwell took over as mistress of ceremonies to introduce the dignitaries. Senator Ben Cardin spoke on how he helped push the bill through the senate with the chiding from Rep. C.A. “Dutch” Ruppersberger who sponsored the original bill. 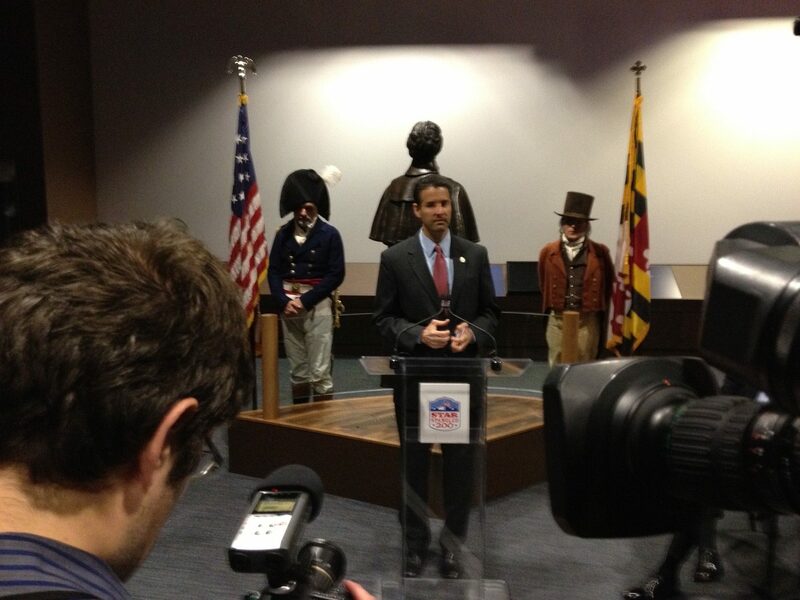 Rep. John Sarbanes, whose district includes Fort McHenry, spoke next and Maryland Governor Martin O’Malley followed. 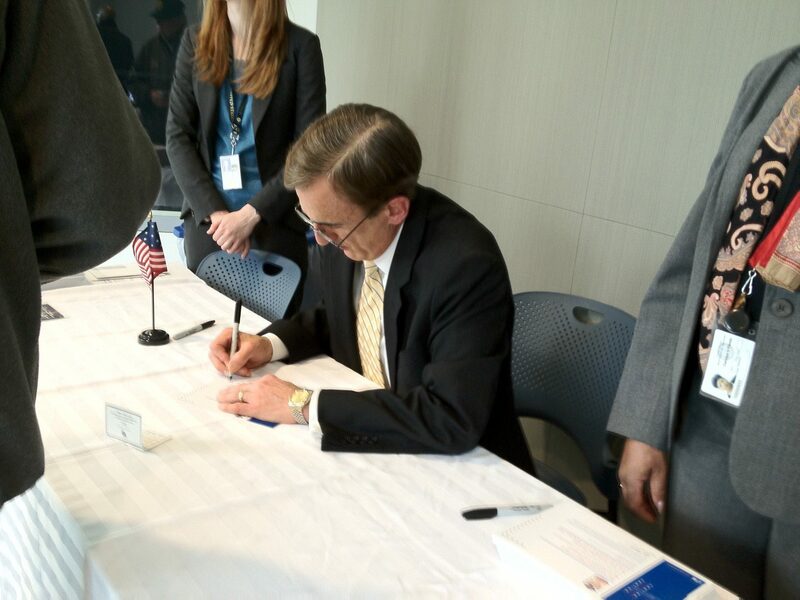 The program concluded with a few words from U.S. Mint Chief Counsel Daniel Shaver to open the sale of the coins. Waiting in line to purchase the silver proof coin following the ceremony was Melissa, a paramedic from Orlando who was in Baltimore for training. 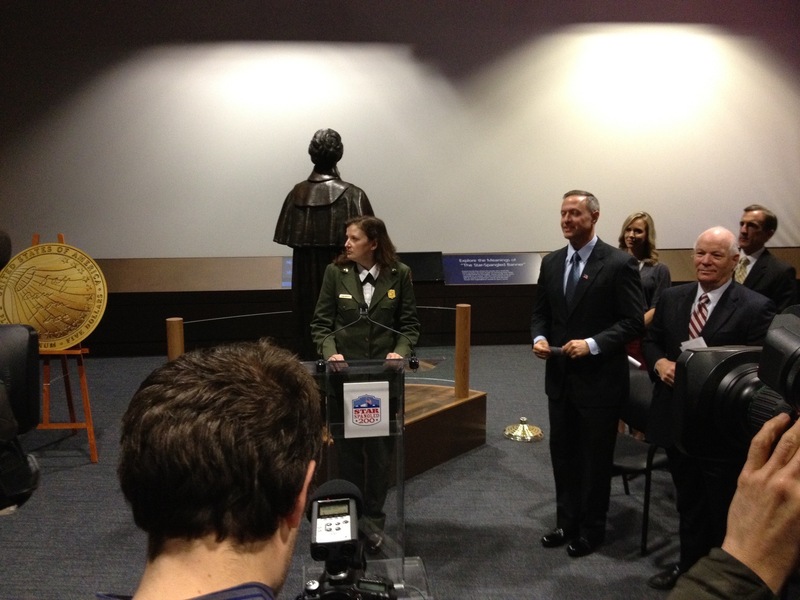 She was with her family visiting Fort McHenry not knowing about the launch ceremony. When asked about the ceremony, she said, “I thought it was very professional. It was awesome. 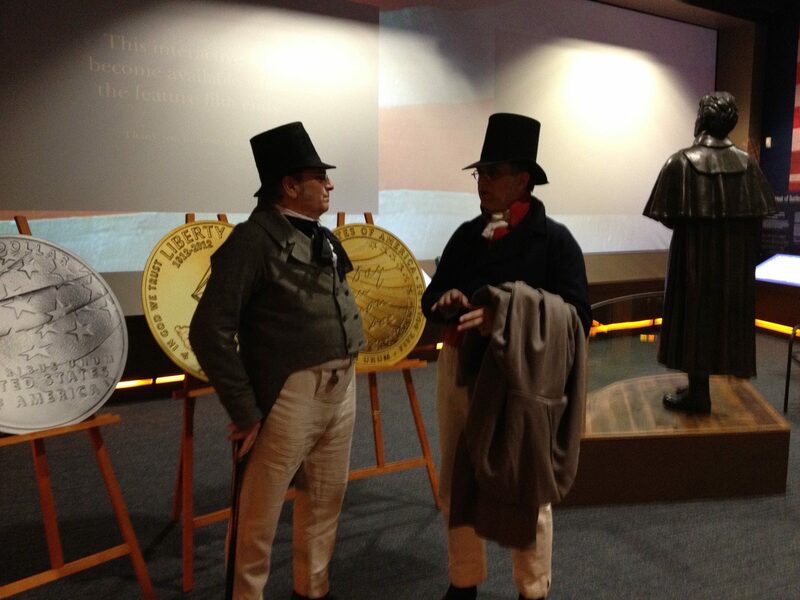 It was moving very moving.” After purchasing the coin Melissa and her family toured the new Visitor Center before visiting the fort. 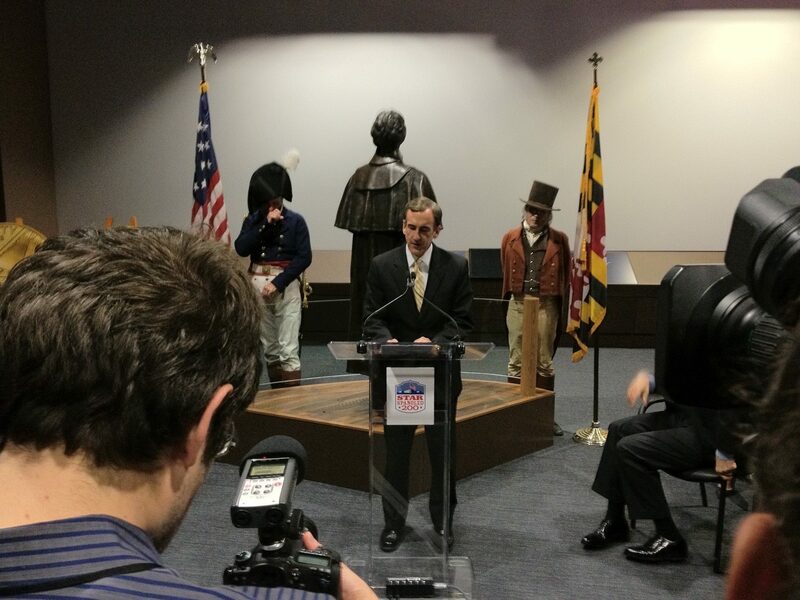 Richard Hughes came to the ceremony from Annapolis, the state capital for the launch. He was asked about the silver coin he was about to purchase and said, “I like it. It’s provocative. 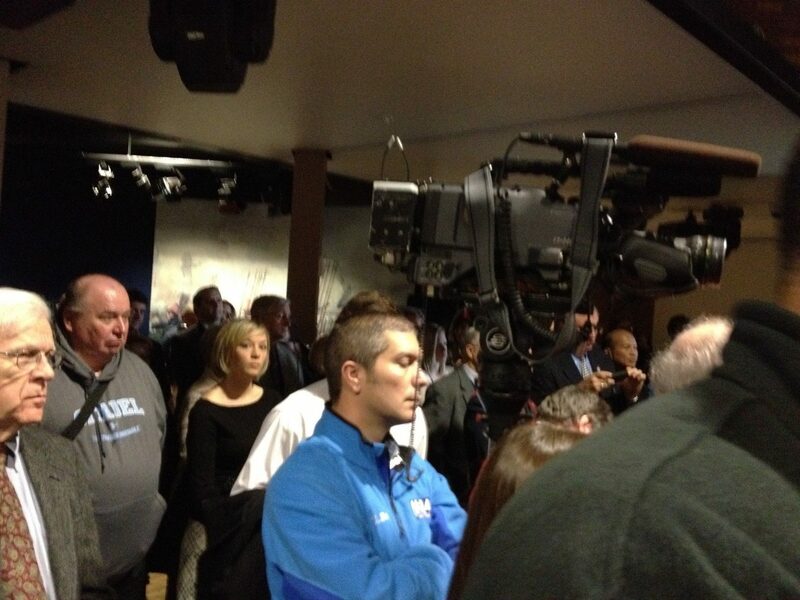 I think they did a good job.” Several people standing nearby in the line agreed. 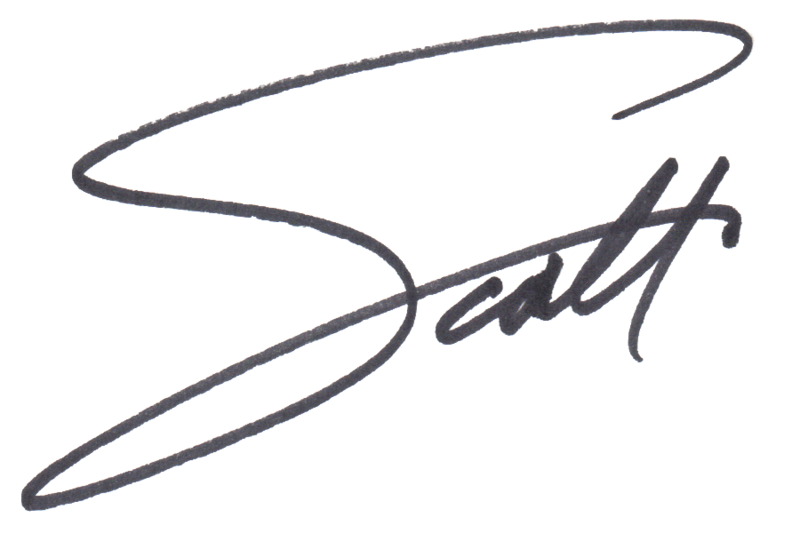 Butcher is a member of the Frederick Arts Council and is an elected board member of the Frederick Tourism Council. 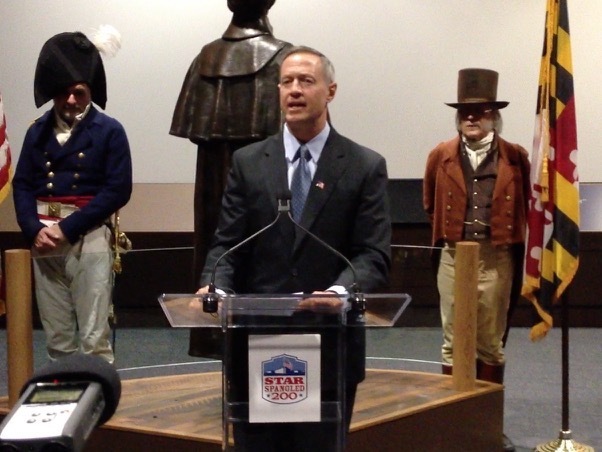 He boasted how Frederick is part of the War of 1812 Bicentennial celebration organized by the state and that Frederick is planning an additional celebration to honor Key’s writing of the poem to take place in September 2014. 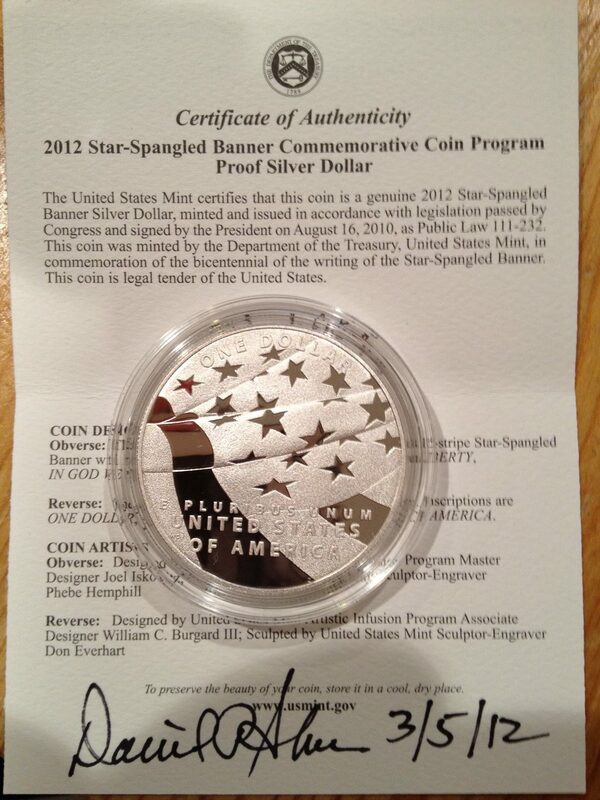 The 2012 Star-Spangled Banner Commemorative Coins are available as $5 gold coins and $1 silver. 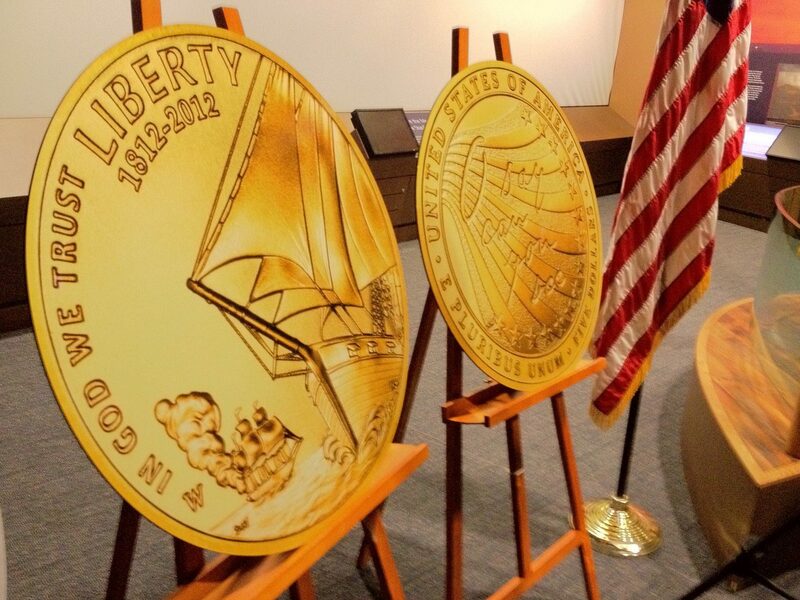 Both can be purchased as uncirculated or proof coins from the U.S. Mint. 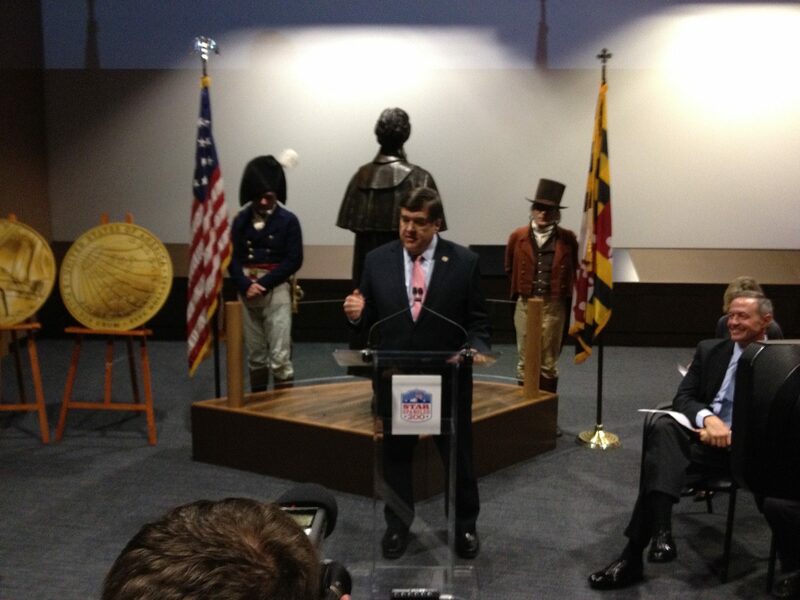 Surcharges collected from sales of these coins, $35 for the gold coin and $10 for the silver coin, will be paid to the Maryland War of 1812 Bicentennial Commission to support the celebration that will last through 2014. 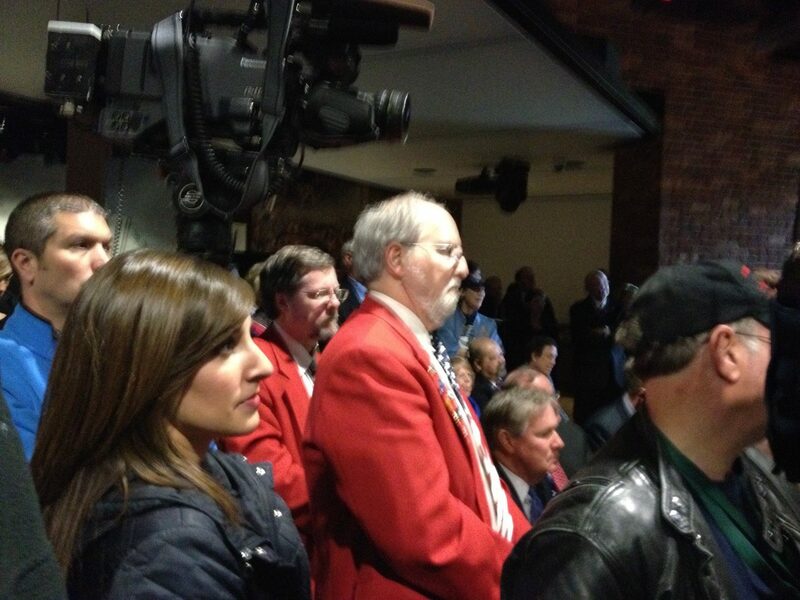 Maryland State Numismatic Association President Frank Murphy (background) and MSNA Board Member Don Curtis.